The Gift of Truth, Inc.: Uncommon Favor! If you have ever watched me on Periscope or seen my posts on Facebook, you know that I speak often about "uncommon favor". I can't remember when God spoke these words to me but they have been in my spirit ever since. What distinguishes "favor" from "uncommon favor" is that the latter is not something that happens often...it's extraordinary...it's above and beyond the favor that we are accustomed to receiving. What have you not received because you refuse to step out of your comfort zone? Like Peter, we have to step out of the boat in faith. Keep your eyes on Jesus and walk on the water! Don't limit God based on past failures or the experiences of others. Ephesians 3:20 says, "Now to Him, who is able to do exceedingly abundantly above all that we ask or thing, according to the power that works in us." It's all about what's working on the inside of you! I hope that something I've said in this post has made you re-evaluate your faith. 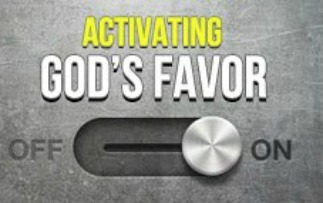 I want you to stop boxing God in and allow him to release his uncommon favor in your life. Raise your level of expectation! I pray that God will literally blow your mind in this next season of your life! And remember the words of Jesus in Mark 9:23, "Everything is possible for one who believes." Dare to believe!